The point was to show that regardless of position, each person is valuable and contributes to a company’s success. At times the ball was hit forwards but, to our amazement, landed just behind us. This is how things go when we try out something new and refuse to take ourselves too seriously. 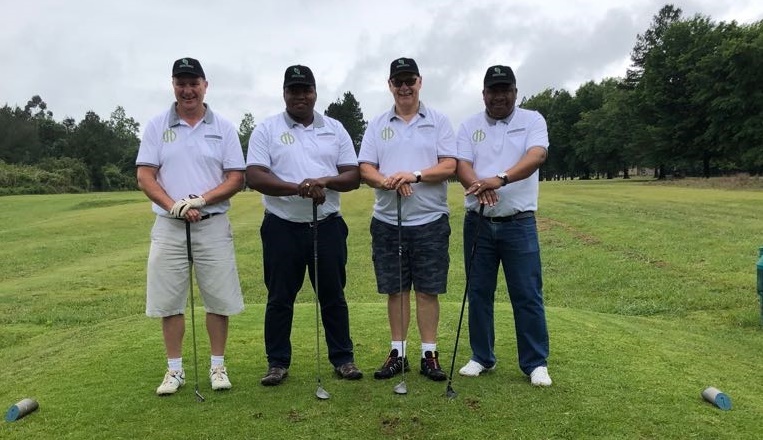 Dolphin Bay is delighted to have continued being the main co-sponsor of the Dolphin Bay Montigny Golf Day, held at Usuthu village, outside Mbabane in Swaziland on Saturday 3 November. Of the 72 players at the event, 52 were from Montigny and 20 were from the other sponsors’ companies. Many had never wielded a club before. “It was a day of hits and misses, lots of fresh air, and fun and laughter,” said Dolphin Bay’s Mark Duckham, who was delighted to get in a round. “The wonderful thing is that everyone had fun. Montigny is a reputable and highly-respected company, and a loyal client of Dolphin Bay’s. Starting small, they have grown in leaps and bounds over the years. “The golf day was really wonderful,” said Montigny MD Ward Rijkenberg. “The highlight was looking around and seeing the smiles on everyone’s faces. It really highlighted the unity in the team. Montigny’s former director, Neal Rijkenberg, stepped down recently after being appointed finance minister of Swaziland. “We are extremely pleased about this development,” said Bertus. “We believe governments around the world would benefit from including ethical and respected business people in positions of strategic leadership.